A few days after my son started his gym routine, my husband joined in, and now about four-five times a week we have a family night out at the gym followed by a nice home made dinner. Teenager: Oh, did you see that cool car Mercedes SLS AMG?! That car is a super chick magnet!- exclaimed he, turning his had. Husband: You said that Mercedes is not a cool car anymore. Teenager: Not that one. It costs around $200,000, and is one of the best muscle cars,- said he, going into technical details. Husband (after teenager finished his flow of technical eloquence): What other cars are cool? Teenager: Toyota's Prius is cool. A new generation of chick magnets, - declared he, proudly. Husband, articulating slowly: Why Prius? Teenager: Many girls are all about protecting the environment. Being sustainable and green for them is like a new fashion. Prius fits in their environmental set of mind. I am telling you, Prius is a new chick magnet! I know, - and nodded his head as an expert. Both, husband and I, tried hard to hold a sudden urge to laugh. BBQ Ribs "Kissed by smoke, hugged by sauce, licked by fire..."
There's no recipe for those ribs, mainly the process. Technically, it's not BBQ as I made it in the oven. I marinated meat in herbs and spices with a little liquid smoke, wrapped the ribs in a foil and refrigerated for 24 hours. Then I baked the ribs at 200 F (95 C) for 4 hours. After the ribs had been in the oven for 4 hours I opened the foil and increased the temperature to 450 F (235 C) and let it brown for another 20-25 minutes. That's when you can baste the ribs with the BBQ sauce, but the husband doesn't like it, hence I serve the sauce on the side. Take the ribs out of the oven, cover with a foil and let it rest for 15 minutes. We love ribs, too. Thanks for describing how you make yours. Interesting to hear young people talk about what they like and how they feel about things in general. Hahaha that is so funny! Love that story, and those ribs looks amazing!!! How nice you all go to the gym together! We love ribs! It's what I'm making for dinner tonight, and I can't stop thinking about them...and then you post ribs. LOL! I had no idea that the Prius was a chick magnet these days. Absolutely mouth watering! OMG ITS 5am and I want some! Happily following your awesome blog! LOL, that was pretty funny :-), although I see how it can work, I like hybrid cars but the mentality has to go with it too! Great picture! Funny conversation :) Your recipe caught my eye! Sounds delicious and my husband will love it! I like my sauce on the side as well and your ribs look great. Yummy! 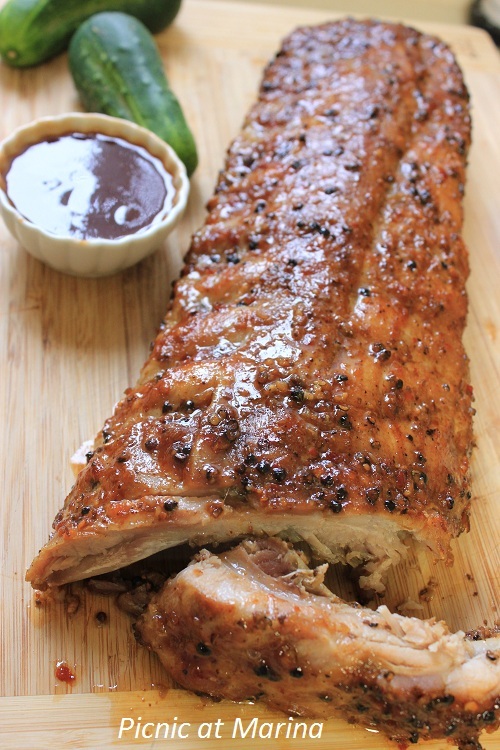 These ribs look fantastic! Your son is hilarious. I love the prius is the new chick magnet. Fabulous ribs. I love ribs but don't make them often enough. These look so moist and delicious. Such a great post. Loved the story and LOVED these ribs. Thank you for sharing your creativity with me! I've been baking all day, and I'm eager for sleep, but I'll now be dreaming sweet and delicious dreams thanks to you! I hope you have a wonderful Monday. Your method is similar to how I prepare ribs but I bet yours is far superior. Marinating the ribs for a full 24 hours must make your ribs very flavorful. I need to try this. Thanks for sharing! I love that the Prius is 'chick magnet' clearly your sone knows some cool chicks. Cars and chicks, that's a teenage boy for you. Good looking ribs. I should not be reading about ribs at breakfast time. Beautifully cooked!!! I can see the juices of this meat and yes most men (and not just men) would be mad about it! Mouthwatering the meat looks so tender. I did not know that the prius were such cool cars. Ribsss... I love these... Definitly have to cook some. Yours looks lovely! My eyes glaze over when the men in my family discuss cars...the car conversations at your house sound a bit more interesting :) And your ribs look marvelous...my guys would love them! hehe, boys (and men) are so funny! Love your ribs, they look bone-licking good! Love the gorgeous dinner dish! Your ribs look fabulous! These bbq ribs look so tender and perfect...even at 10am! Biiig question - what herbs? what spices?? Want to make that succulent recipe! And oh, I hate barbecue sauce too, so totally understand your husband's sentiments. Ok, I am going to tell you a discussion between my son and husband in the car. We were discussing about the languages he will learn apart from Greek. At school it is obligatory to do English and then he can choose among French, Italian and German as a second language. Do you know what has he asked? Which one from these countries has the most beautiful girls and that would be the language he would learn. Point has been made, men are the same everywhere and at every age lol! My son by the way is 9.5 years old. The ribs look fantastic! Marina, such juicy, succulent, and perfect slow cooked BBQ ribs that virtually no-one can resist. Love that you raised the temperature at the end to finish browning it, and adding the sauce on it! Haha, funny how times have changed. Maybe for the better too. Your BBQ ribs look mouthwatering. Thanks for sharing. This story's so funny : ) and the ribs looks delicious! Lol!! I turn off when the teenage boys start talking cars ;) it's all blah blah to me! But I know I would be the most popular wife and mother if I cooked up this delicious slab of ribs for the boys!!! Even hubby glanced over to see what delicious piece of meat was! Me man - me want ribs! They look lovely Marina! I was just talking to my husband yesterday about how much I love BBQ'd ribs and yours look so mouth-watering! Thank you for your visit and I apologize for being late in my visit to you, but I've been super busy packing for my trip to Italy. If you are interested, I have a giveaway going on while I am gone for two weeks.